I have seen many people’s life being wrecked by credit cards but I still feel that we should take better responsibility towards our financial health. There are in fact, many credit cards in the market and more will be coming out soon because there is a strong demand for it. I think that one problem many people faced when using their credit cards and then getting a shock at the end of the month is that they never read the finer prints. For example, 0% credit cards are so attractive, but is this an introductory offer? I know many of my friends who have accumulated debts from different credit cards that they keep looking for cards that offer 0% balance transfers to save on paying interest rates. Personally, I think the credit card is one of the most misused and abused item in our daily life! 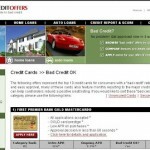 Everyone should understand what the differences are in credit cards and how to use them properly. I find the information available on The Thrifty Scot very easy to understand plus they are not trying to sell us anything but give us valuable advice and helps us to look at the big picture with every card and the fancy terms these credit card companies use. This entry was posted in Self-help and tagged free money saving advice, money saving advice, The Thrifty Scot, Thrifty Scot on September 19, 2007 by Cyberpartygal.